It may seem that Mars was once a much more exciting planet. True, there are dust storms and possible water-seeps occurring today, but billions of years ago it was a dramatic place with huge volcanoes, a giant canyon system and branching river valleys being formed. But now planetary scientists have identified what looks like more recently formed volcanoes, in geological terms. Excitingly, they may have once provided the perfect environment for microbial lifeforms to thrive. Mars' Olympus Mons is the solar system's largest volcano – 22km high and more than 500km across its base. It began to grow over 3 billion years ago, but some lava flows high on its flanks appear to be as young as 2m years, judging from the relative lack of overlapping impact craters. Craters caused by asteroid impacts show how old a surface in the solar system is – the more craters the longer it has been around. However, fresh lava from a volcano can bury former craters, resetting this clock. This is exactly what's happened at Olympus Mons, and indeed several of its neighbours, which means these volcanoes are unlikely to be extinct. They may even be able to squeeze out some lava again in the future, although we might have to wait a few million years to see it happen. 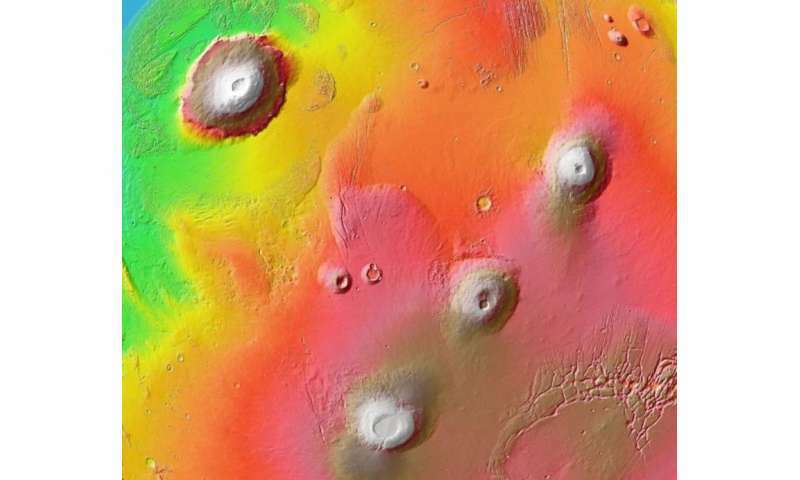 But are there still volcanoes forming on Mars? Where are the youngest ones, the volcanoes that sprang into life most recently? Researchers have previously spotted various clusters of small and evidently quite young "cones" – symmetrical hills with summit craters – but their origin has always been controversial. They could be true sites of volcanic eruption, but they could equally well be "mud volcanoes" formed by expulsion of mud from below ground or "rootless cones" formed by explosions caused by lava flowing across wet or icy ground. Now a study by a Czech-German-American team led by Petr Brož presents convincing new evidence convincing new evidence that at least some of these are genuine volcanoes. Brož and his team studied cones in Coprates Chasma, the deepest part of Mars's Valles Marineris canyon system. This is far removed from any of Mars's main volcanic provinces, and suggest magma has erupted from the interior though ancient but reactivated fractures in the canyon system. The researchers are convinced that these are true volcanic cones, similar to common volcanoes on Earth known as scoria cones and tuff cones. 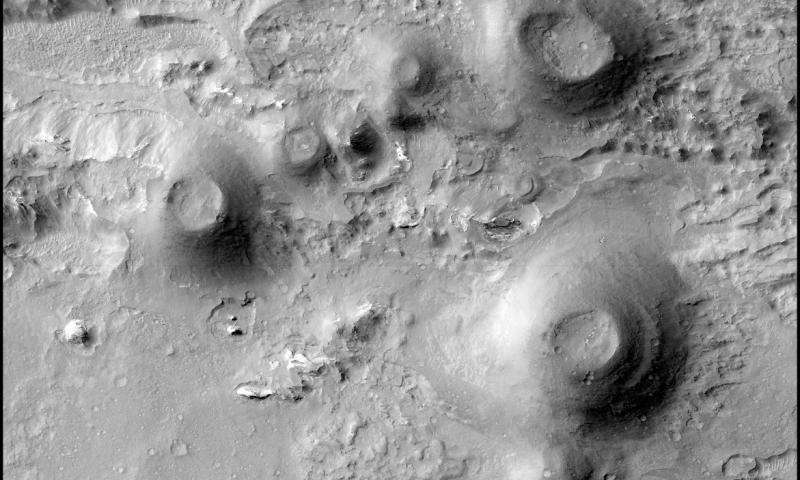 They base this on the fine layers visible on the inside of the crater walls on images from the HiRISE (High resolution Imaging Science Experiment) camera of NASA's Mars Reconnaissance Orbiter (MRO) and other evidence. The detail in the images is sufficient to reveal that the cone is built of layers in a similar way as in tuff cones on Earth. The cones themselves are too small to date by counting impact craters, but crater-dating of the surrounding terrain (which would be similar in age) comes out at about 200 to 400 million**** years – around the time giant amphibians and early dinosaurs roamed the Earth. On our planet, cones like these are built in a single episode of eruption (which may last weeks or months), so this date almost certainly pinpoints the birth of these small volcanoes as well as their demise. The cones must have been built by explosive eruption of clots of lava, from the size of a grain to that of a brick, from a central vent, growing the cone layer by layer until reaching its final height. Each cone's surface may be "armour-plated" because these clots hit ground still hot enough to partially weld together and protect it. This could account for their fresh appearance, in contrast to mud volcanoes, which would be more vulnerable to erosion. The findings are exciting for many reasons. Volcanism this young on Mars suggests there's still some volcanic action on the planet – and there could still be volcanoes forming today. So far, the team have obtained compositional information from just one of the cones using MRO's Compact Reconnaissance Imaging Spectrometer for Mars (CRISM). This reveals the presence of a mineral called opaline silica as well as sulfate minerals, which suggests that the hot rocks, whether before or after after eruption, reacted with martian ground water. If so, there could have been, even if only briefly at each volcano, a suitable mixture of water, warmth and chemical energy to support microbial life of the kind that inhabits hot springs on Earth. Given that the cones in this study are at least 200 million-year-old, they are unlikely to host life today, but they would be good targets to search for fossilised microbes with minimal risk of contaminating an active ecosystem.